What separates good improvisers and soloists from amateurs? I remember having an experience when first learning to improvise and thinking – this sounds lame, just like scales over and over. Meh. It only took one shift in perspective to make a huge difference though. Once I figured out this key element, I sounded legit! The key is ‘vocabulary’. I’m not talking about learning the words about blues, or jazz, or country. But the ‘words’ of music – the small phrases that make up solos. Think about how a baby learns to speak. They start out mimicking sounds. Then they get a few words. Once they have a handful of words, they speak nonstop! Even when it isn’t making a lot of sense, just so they can try to express themselves. Music isn’t any different! In order to speak, you first have to imitate what you hear. You’re not going to sound right at first – that’s OK. The process will get you sounding good quickly. One thing you may have noticed in this analogy is that babies don’t start with spelling, grammar, and syntax. Blues Guitar Language starts with imitation and then later on learn the other elements of language. Music approached with scales and chord theory first is exactly as strange! Instead of starting with the spelling and grammar, start with imitating the words. 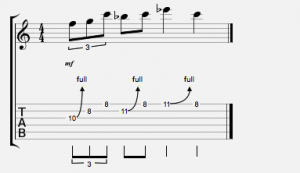 So, what are ‘words’ in Blues guitar …. or jazz guitar, or country guitar, whatever? They are short phrases that can be used in a lot of different contexts. We normally call them licks. Only this time we’re not going to be focused on the lick, but more on the context. 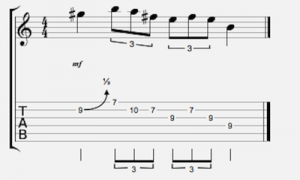 Take this blues guitar lick here. Notice how the end of the lick goes to the 5th of the key. Now, if you learned this ‘word’ and tried to play it on the first bar, it would likely sound out of place. Try it different areas of the blues form. If you try it on the second to last measure… it sounds right! Eureka, we’ve found the context where this lick will work! Now when you play a blues guitar solo, try playing that lick everytime in bar 11. Instant cred. 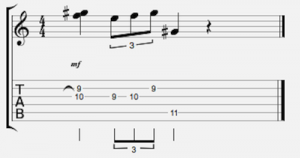 This is a lick by Magic Sam that is from a blues in B. The lick though, happens on the IV chord which is E in this case. Check out how he immediately establishes the chord by bending up to the 3rd (G#) of the E chord. Again, this would still basically work over the I chord, but when you highlight the chord notes that change from chord to chord, you sound like you are playing the song, not just slapping a scale down over the progression. This one works just about everywhere, but it does sound most effective when the last note is played on the first beat of the measure. So in this case, it’s not so much where you play it, but how you resolve it. Approaching improvisation this way will help you make enormous progress in your improvisation and quickly develop your own blues guitar language. Make sure to check out my latest book on Amazon, called “Blues Language.” It’s a very detailed looking at over 100 authentic, transcribed pieces of blues guitar vocabulary which will add instant credibility and authenticity to your playing.